(Documentary Feature) Our CANADIAN CURATED FEATURE and World premiere of made-in-BC film ALL OUR FATHER’S RELATIONS, records the fascinating, interconnected histories of Chinese Canadians and First Nations—often respectful, and mutually beneficial—along the Fraser River in British Columbia, which date as far back as the 19th century. 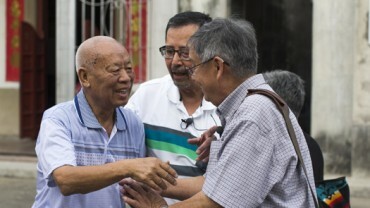 The film features Grant siblings Helen Callbreath, Gordon Grant, Larry Grant, and Howard E. Grant, elders from the Musqueam Nation with Chinese ancestry. Their father, Hong Tim Hing, left the village of Sei Moon in Guangdong, China in 1920 for Vancouver, BC—the unceded territory of the Musqueam hən̓q̓əmin̓əm̓-speaking people—where he worked on the Lin On Farm at Musqueam Indian Reserve 2 and met his wife, Agnes Grant. The siblings reflect on their experiences growing up on the Chinese farms at Musqueam and in Vancouver’s Chinatown; on the impact of discriminatory government legislation on their lives; and visit the ancestral village of their late father in Guangdong, China, for the first time. This thought-provoking, moving film is an integral step toward fostering dialogue, inquiry, and reflection regarding the intersecting histories of First Nations, Chinese, and Canadian issues, both in communities across Canada, and in China. A Best Canadian Feature Award nominee.